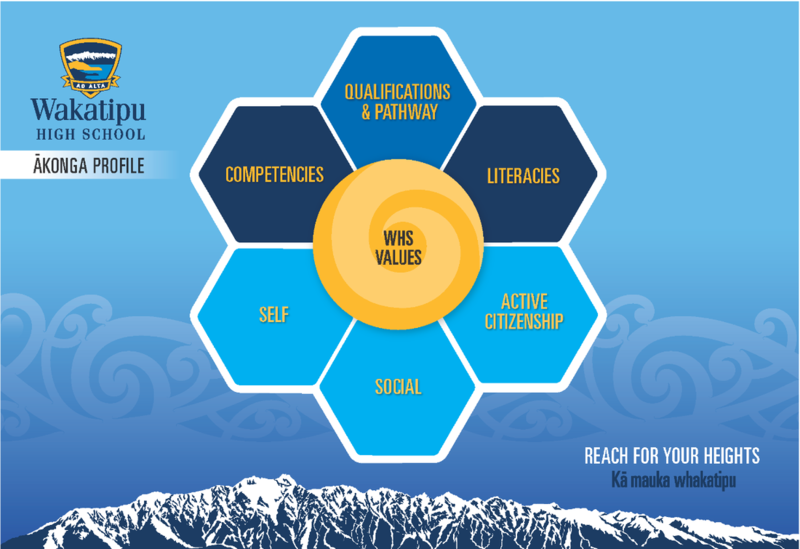 Wakatipu High School's 'ākonga profile' sets out a comprehensive approach to education which focuses on essential skills, holistic development, our values and future-focused qualifications and pathways. Ākonga is a te reo Māori word, which in this sense means student, pupil, learner, protégé. Literacies (skills, knowledge and processes) - numeracy, literacy, digital, scientific, financial, civic, artistic, technological. Competencies - self-management, collaboration, curiosity, critical-thinking, creativity, problem-solving, metacognition. Self - awareness, confidence, well-being (physical, mental and emotional). Social - empathy, communication, effective relationships, connectedness. Active citizenship (local and global) - kindness, positive contributor, service, sustainability (environmentalism). Excellence, Panekiretanga – striving to achieve our personal best, in everything we do. Respect, Te whakaute – for self, others, WHS, and the environment. Responsibility, Takohanga – choosing our responses, and being accountable for our decisions, actions and consequences. Resilience, Te manawanui me te ū – being able to cope with and grow from challenge. Inclusion, Kotahitanga – actively welcoming and including all, and creating a safe environment. Career and pathway (to study, training and/or employment) options explored and identified. Subjects selected and qualifications achieved and/or experience gained to support progress on the pathway. The Wakatipu High School Charter can be found here. The Wakatipu High School Policies and Processes can be found here.